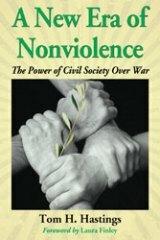 I'm doing a Book Notes for "A New Era of Nonviolence: The Power of Civil Society Over War (McFarland, 200 pages, foreword by Laura Finley, quality paperback, notes, bibliography, index, $40.00) rather than a book review because I know the author, Tom H. Hastings, Ed.D., and didn't want this to influence me. This book is an exploration of nonviolent strategies and tactics that have been used to prevent and end civil wars, invasions, and occupations. The problem of war is examined in light of efforts to transform destructive conflict into constructive conflict. Research into alternatives has produced a corpus of knowledge that enables civil society increasingly to expect success when it engages decision-makers in peaceful conflict resolution. The book asks the reader to consider the questions of social conflict using a cost-benefit analysis—which can reveal the advisability of strategic nonviolence. Research into the causes and correlates of war is robust, and when that research is applied to comparisons of conflict management methods, numerous conclusions about potential strategies for ending war emerge. I recommend Tom Hastings' book without reservation. I agree with one of the central points of the book that civil wars are the biggest crime of all (Page 15) and that most of the wars being fought are civil wars. Look at Syria, Iraq, Libya, Sudan, Egypt, Nigeria, where another Islamic attack in the capital city just killed dozens of people in a shopping mall. The longest civil war still being fought: Burma, where the war began in 1948! Queried on the subject of boycotts and disinvestments, Tom replied to an email: "Yes, the economic sanctions are most needed against the parties who are the most violent. I'm sorry I wasn't clear enough on that. I think the Israel example is so salient to some because the US just sends them so much military aid with no strings attached. But even more germane this season is Egypt. It's unreal that [U.S. Secretary of State John] Kerry just reassured [Egyptian President] Abdel Fattah el-Sisi that all aid would be flowing to him. Just surreal." I want to make my position clear. I think we ought to stop all military aid to all parties in the region, Israel, Jordan, Egypt. These countries all are rich enough to buy all the military gear they need -- or think they need! 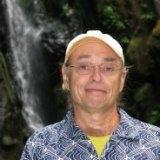 McFarland's website: www.mcfarlandpub.com. The publisher says the book is available from all major book sites; additionally, all McFarland titles are available from all major ebook providers, including Amazon Kindle and Google Play.